For most people, there comes a time when the boat must be put away for the season, the cabin locked up and all is left to fend for itself through the slumber of the winter. In most locations, you will use a boat cover or store a small boat in open or unheated storage. Larger boats will be secured to the dock or hauled out and winterized. The number one thing that people complain about is the smell when you get back to the boat in the spring. Go2marine is here to offer you some understanding about what happens during the winter with moisture and what can be done to protect your boat. If your boat is small, you should first get a boat cover to protect the topsides and interior from weather and reduce moisture coming in from the environment. If your boat is large, you will need to seal it up well; yet still supply some form of ventilation. The number one enemy of the interior of boats in the off season is moisture. Fungus (Fungi) consist of molds, mildews, yeasts and more, in this unique Kingdom that is neither animal nor plant. Fungi are part of the natural environment and operate primarily by breaking down dead organic matter such as fallen leaves and dead trees. Indoors, fungus growth tries to break down dead matter (wood, cotton, rayon and other organic materials) as well as pseudo-organic materials (like foam, polyester). Fungi reproduce by many means, including tiny spores; the spores are invisible to the naked eye and float through outdoor and indoor air. The more commonly recognizable mold and mildew may begin growing indoors when mold spores land on surfaces that are wet. There are many types of mold, and few of them will grow without water or moisture. This Kingdom makes up the most diverse life on the planet with worldwide distribution and some 1.5 million species. Fungi also has the ability to become an allergen, irritant or significant pathogen to humans. Fungi gradually destroy the things that they grow on. Ultimately Fungi thrive as a result of a high level of moisture encouraging their growth; rather than trying to just treat the fungi to kill them, resolve the moisture issue to prevent the problem that encourages Fungi growth. Requiring Power – For boats that are left within the reach of an extension cord or dock cord you can help keep moisture to a minimum with a number of heater or dehumidifier options. GoldenRod Dehumidifiers offer inherent safety features like no fan, simple installation, constant heat output and simplicity. They eliminate dampness, mildew, condensation and humidity with size options for areas from 100 to 500 cubic feet. Extreme (Xtreme) Heaters takes a higher tech, more active approach to keeping moisture in control. The XtremeHeater Boat Heater is a heating element that is self-regulated at a pre-set temperature and automatically varies its wattage in order to maintain that pre-set temperature. Non-Powered – If you leave your boat and there is no means to power anything, you still have several options. Hard mounting vents are are installed in the cabin top or on hatches and used when leaving your vessel for the season, while it is uncovered but still weather-tite. The big news here is solar vents that have the advantage of a fan without leading power wires. There are a variety of moisture control devices that rely on a ‘salt’ like Calcium Chloride to draw moisture from the surrounding air and can be used in nearly any location, onboard or under cover. The most common of these is the Dri-Z-Air Dehumidifier. Lastly, if you have a boat cover, a vent with support pole can help in any season with moisture control. This system is easily installed with a pair of scissors and your hands for a clean vent installation. Boat Covers for the Fall & Winter – and years to come! In Need of a New Boat Cover? In most areas of the country, the summer season of boating is drawing to a close. Protect your boat with a new boat cover from Go2marine; all major boat cover manufacturers are covered here! At Go2marine, we would like to share some ideas and information to help you choose and use your boat cover… lest your cover end up like this sad picture. There are a number of things that can be done to extend the life of your boat cover and the ability to protect the investment in your boat. You will need to make choices for a cover based on your local, environmental and storage conditions – then on the boat cover fabric. Poly/cotton (65/35) blends are the least expensive fabric, typically, they are warranted for only a year. Acrylic is the top end material, usually only in heavier weight fabrics (9 0z. plus). 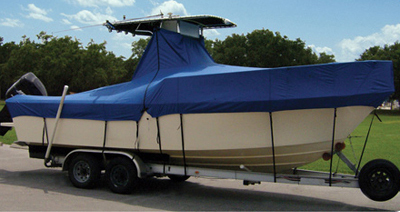 Boat cover manufacturers and their fabrics: Manufacturer – Fabric Name, Material, Weight and Warranty. Taylor Made – Ultima, Polyester, 7 oz., 5 year. Westland – Sunbrella, Acrylic, 9.25 oz., 5 year. ShoreMaster – Prism, Polyester, 9 oz., 5 year. Carver – Poly-Guard, Polyester, 8 oz., 5 year. Taylor Made – Hot Shot, Polyester, 6.25 oz., 5 year. Westland– Sharkskin, Polyester, 6.5 oz., 5 year. ShoreMaster – Sunburst, Polyester, 6.5 oz., 3 year. Where you store your boat and the environmental conditions it is subjected to will affect the life of the cover. How you set up the cover for storage with one of the many options, will also effect the usefulness and longevity of the boat cover. Get a strap system. This is useful for the large cockpit expanse on most boats and will prevent the huge, tearing puddle that can happen. Mounts at four corners connecting at the center with a pad on pole arrangement. Remember: Choose the fabric for the cover that will last the best for your application. If the boat is stored outside, year round, tailored or subjected to harsh conditions then a Top of the line fabric is what you want. If your boat is stored under a carport, on a lift and you are usually good with handling the cover, get the middle range line of fabrics. Lastly, if you are just looking for a “dust cover” to protect your boat while stored, then the base poly/cotton cover will work fine. For all your boat cover needs, contact Go2marine.